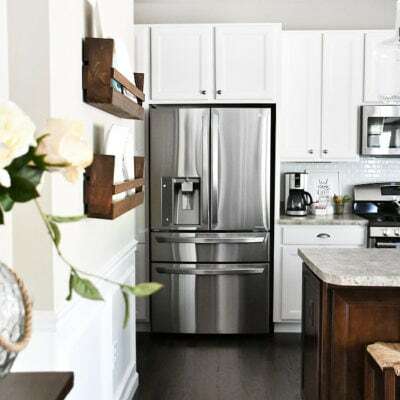 I normally call this area our butler’s pantry since it’s right next to our breakfast room and holds a bunch of our dishes. But since I really don’t have many entertaining supplies, the desk and cabinet area below is basically a breeding ground for junk drawers. In my kitchen alone I have plenty of drawers and cabinets. Yes, I’m one lucky gal and I shouldn’t be complaining. 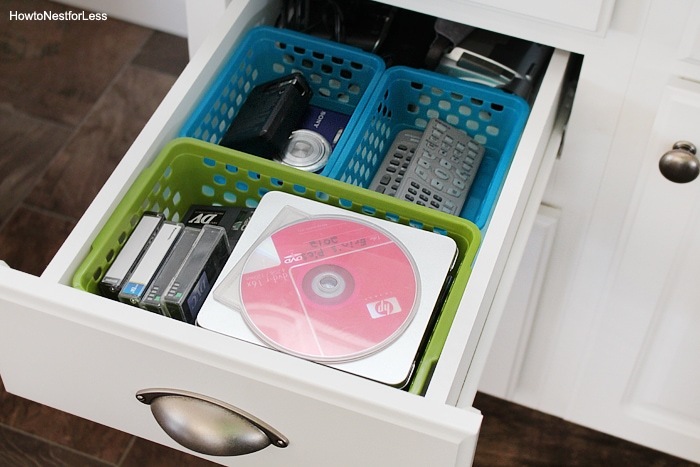 Except that when you have empty drawers, they just kind of accumulate junk. So over the weekend I finally had enough and decided to organize this mess. 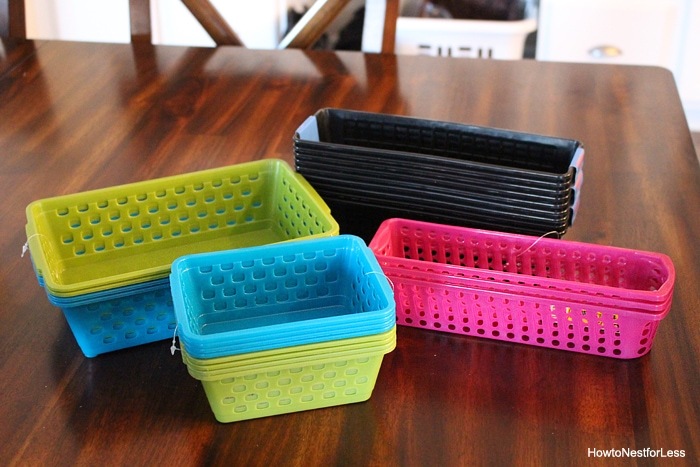 I found a bunch of little plastic trays at Dollar General and spent $8 total. Yep, $8 for some sanity. That basically totaled out to 24 different sized trays in various colors. 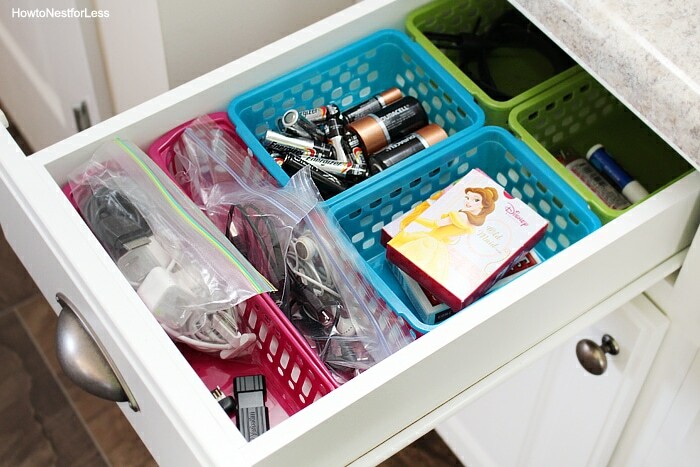 Who knew organization could be so cheap? I emptied everything out of the drawers and put it on my kitchen table. Then I kind of mapped out where I wanted everything to go, grouping similar items together like office supplies and tools. 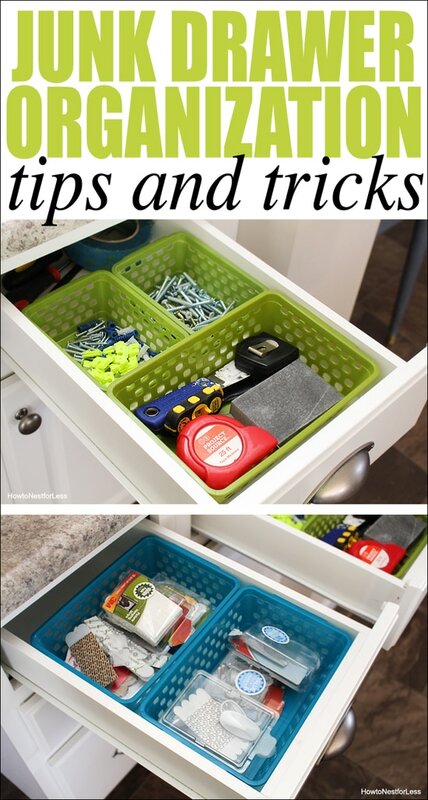 Luckily all of the trays seemed to be perfectly made for the drawers. The long, skinny trays fit 3 across, the medium rectangle trays fit 2 across, and the big trays fit perfectly sideways. In the far left drawer I put most of our misc. items like cords, chargers, batteries, playing cards, etc. 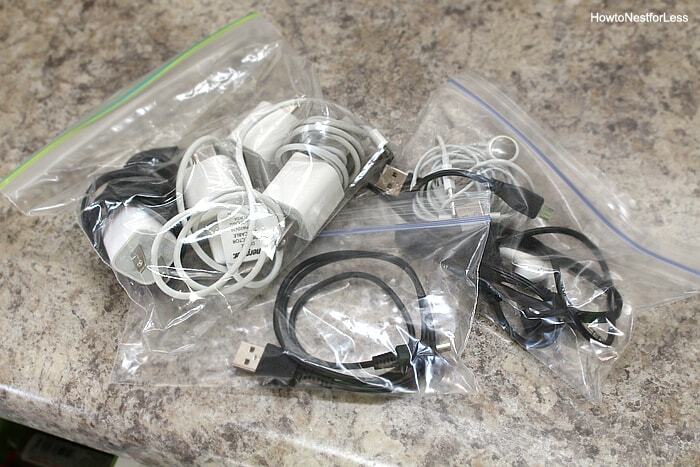 Because cords and phone chargers are my biggest nemesis, I grouped them into small plastic snack baggies. Now I’m just hoping my husband keeps up with this system. 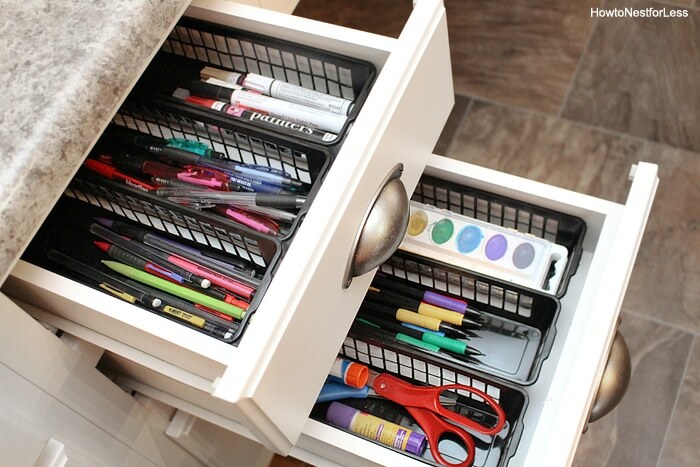 The next set of drawers to the right now organize my office supplies, mostly pens, pencils, scissors, tape, glue and watercolor paints for those rainy days. Just above the desk opening is a large wide drawer. Here I keep scratch pads, paperwork, misc house items, and my home finance and bill organizer. 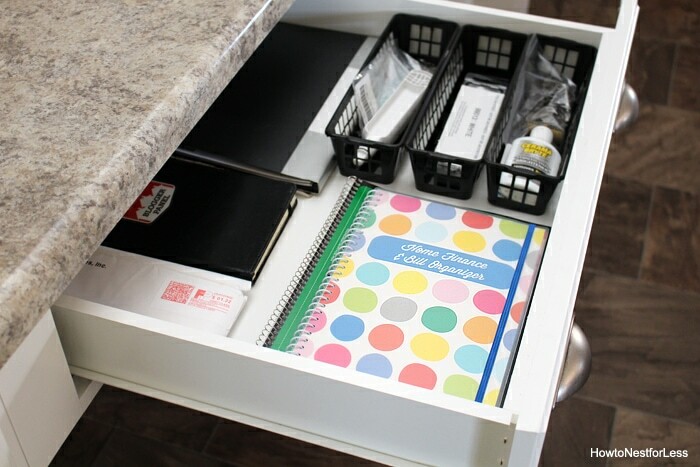 Let me talk for a quick moment about this bill organizer because it’s life-changing. I scooped it up from Dollar General for only $2.55. 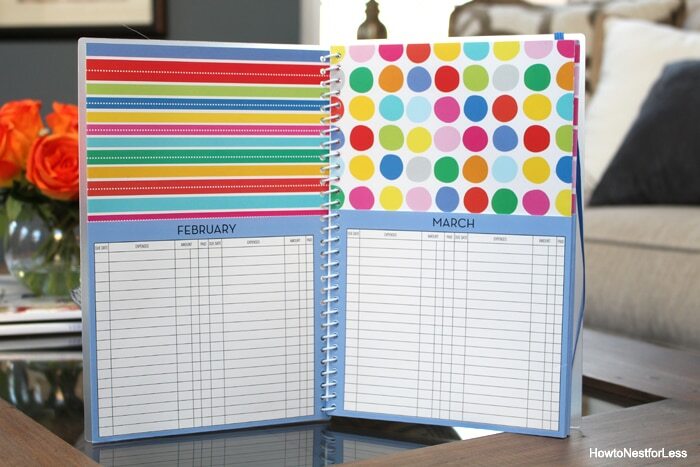 It’s broken up into months with a chart where you can write down your bills or expenses. 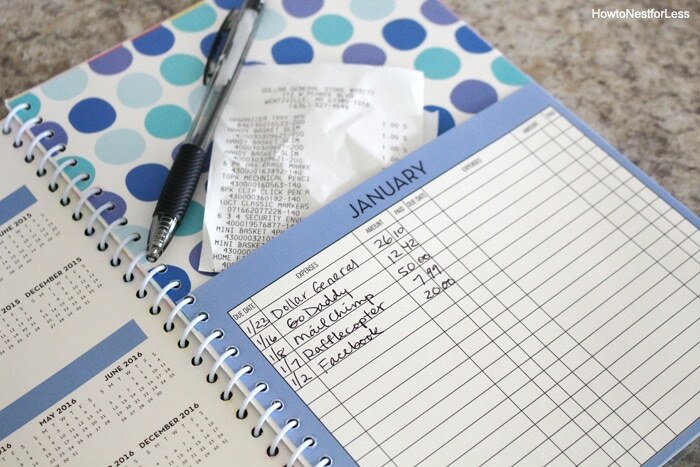 Then there’s also a pocket for each month to keep receipts. This is going to be a huge help for my business. Do simple things like this excite you too, or is it just me? 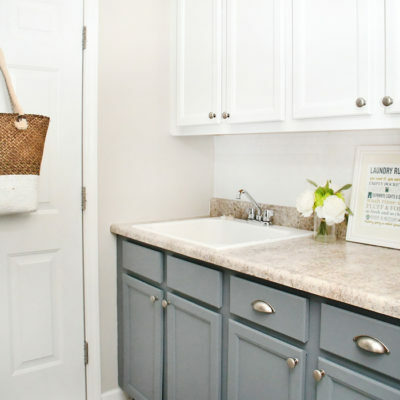 To the right of the middle drawer I have two medium baskets to keep my Command Brand hooks and wall hangers. Yeah, kinda weird to have an entire drawer dedicated to this. I get that. But I seriously had no idea I had so many until I cleaned out all of these junk drawers. Just below that I keep our old camcorder, tapes, family photo DVDs, etc. 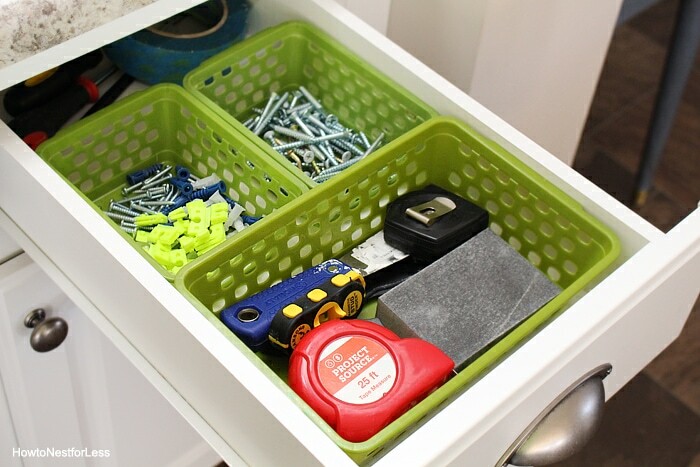 Then the last set of drawers hold some of my everyday tools and DIY supplies. Tape measurers, screws, drywall anchors, painter’s tape, screwdrivers, etc. 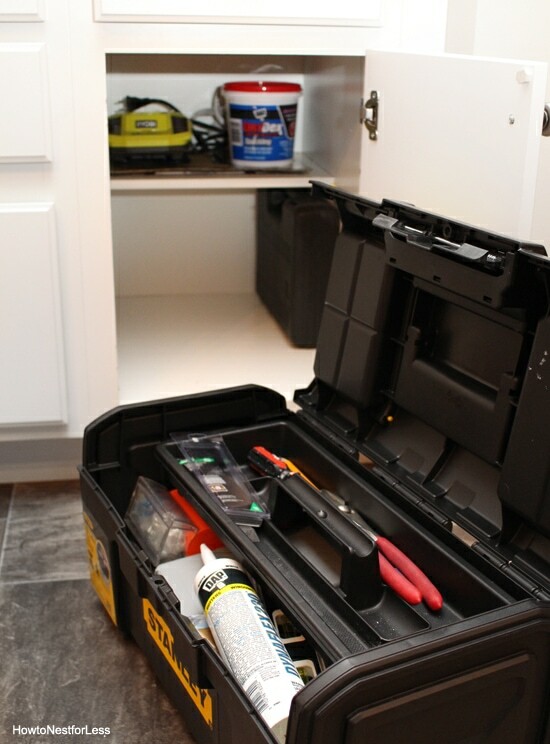 And just below the big cabinet perfectly fits my toolbox and tool set. 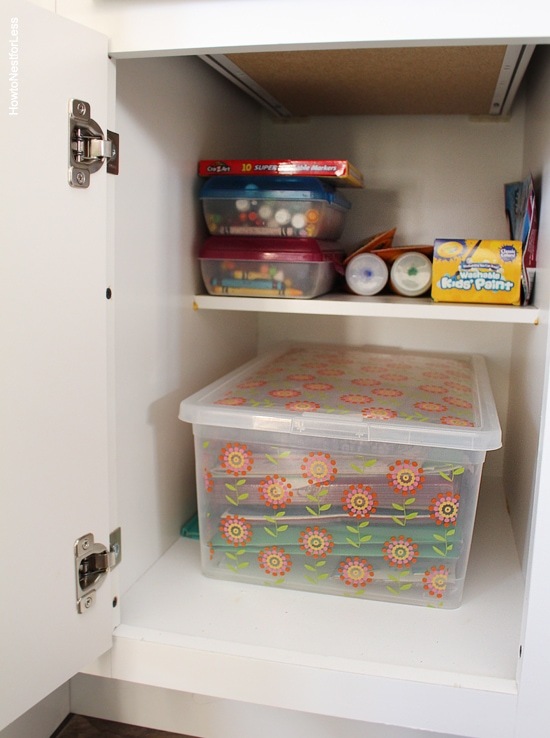 On the opposite side the other big cabinet holds my daughter’s art supplies and my Girl Scout box for our monthly meetings (yep, I’m a leader for 13 first grade girls…. what did I get myself into?). 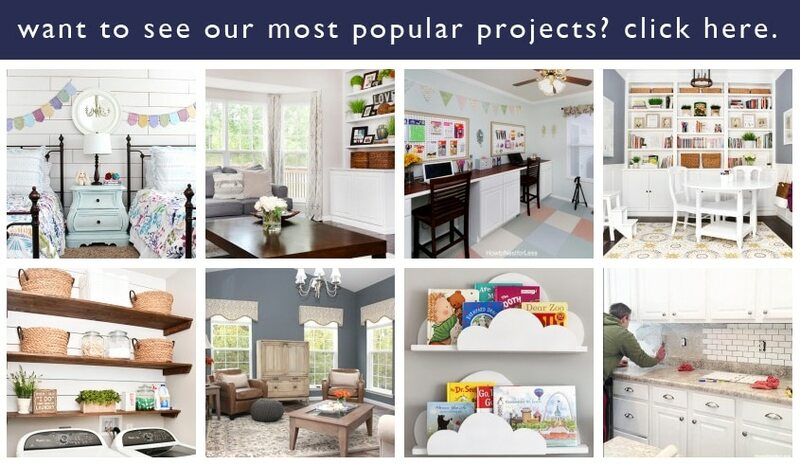 So all of this organization took place on Saturday, but yesterday we started on the backsplash in the butler’s pantry. 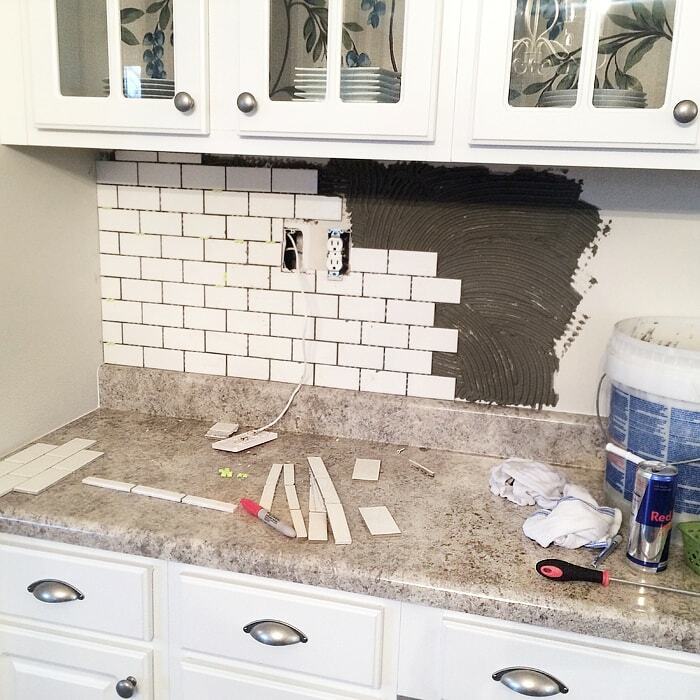 We already finished the backsplash in the rest of the kitchen as seen here back in October. We didn’t have time to grout it since the mortar had to dry for 24 hours, so I’ll share the finished space with you guys soon. 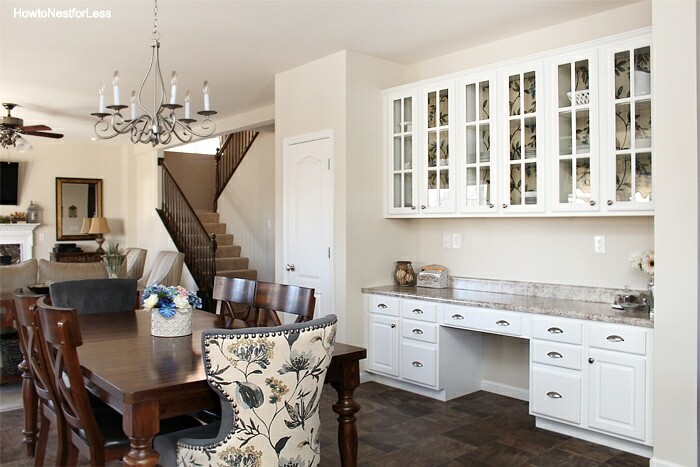 I think I’m also going to paint the back of the glass front cabinets…maybe. Stay tuned and see what I decide! 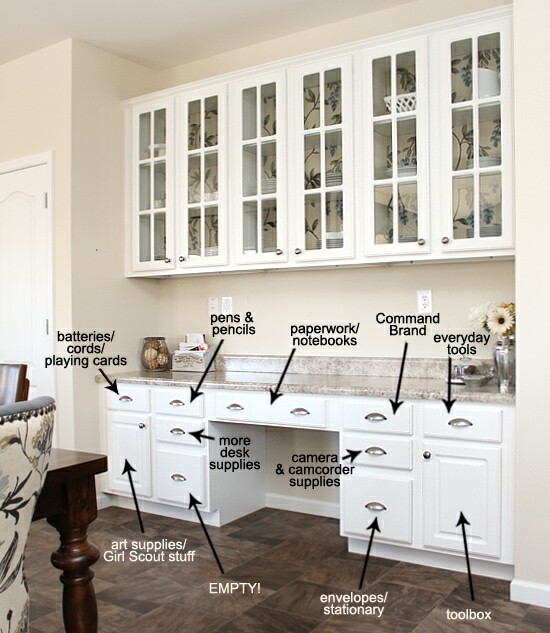 Ha ha – I have all that crap crammed into a single drawer in my kitchen, including a ton of those command strip things. Love how you organized it all. 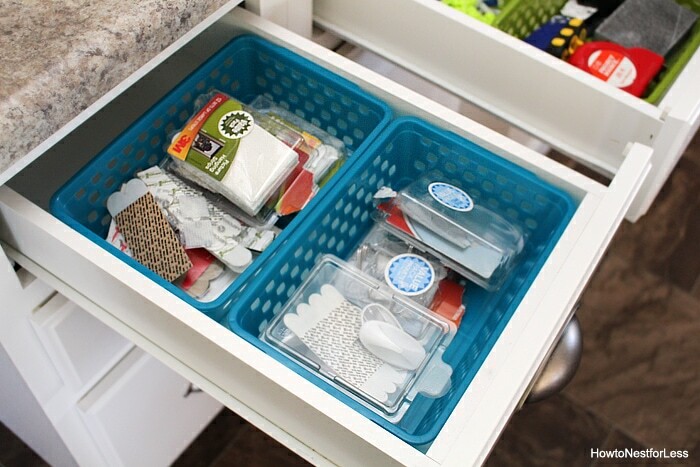 Divide and conquer – such a god idea fro drawers, I bet you were amazing with all the stuff you found in there! 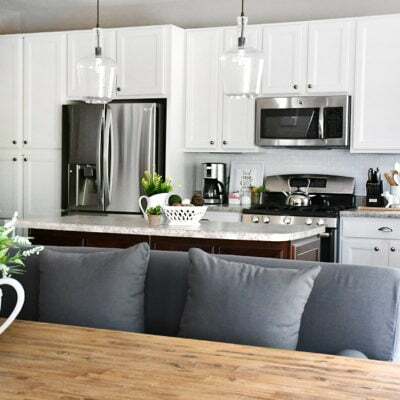 Laminate the pages of your next home finance and bill organizer, then you can reuse it next year! You can also do like me and get a binder with 12 dividers and 12 page protectors. Make a chart and tape it in front of protector, then throw your receipts behind it. It may not be as pretty, but works very well.